Simone Biles closed her Rio Games with more gymnastics gold. Usain Bolt breezed through another sprint as he makes a run at one final Olympic title in his favorite race. Bolt easily won a qualifying race Tuesday in the 200 meters, the first step in his bid for the gold Thursday. His prowess on the track is the dominant story line of the final week of the Olympics, along with Biles’ resounding success in gymnastics. It was a wild ride Tuesday for fans of the Brazil team. Their women's soccer team and top-ranked beach volleyball duo were eliminated from the Olympics, but a lightweight boxer gave the host nation a lift with a stirring victory in his gold medal bout. Robson Conceicao whipped the packed arena into a frenzy with every jab as he claimed the country's first gold medal in boxing. 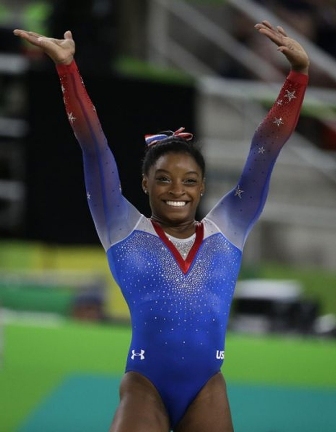 Biles won the floor exercise Tuesday for her fourth gold of the games — only the fourth Olympic gymnast to do so. She added a bronze in the balance beam Monday in what marked the first day of a Summer Olympics since 2008 the United States didn't win a gold medal. The U.S. had claimed gold on every day of the 2012 and 2016 Olympics. The drought proved brief. Christian Taylor won gold in the triple jump to start the day, and teammate Will Claye came in second — a familiar result for the Americans. Taylor and Claye finished 1-2 in triple jump in London as well. It ended up being a pretty eventful day for Claye. Moments after earning his silver, he bounded into the stands, dropped to a knee and proposed to his longtime girlfriend, hurdler Queen Harrison. She said yes. One day after a Brazilian pulled off an upset to win the men’s pole vault Monday night, the women’s soccer team lost to Sweden in a shootout. The Brazil men are still alive, however, and play a soccer semifinal match against Honduras on Wednesday. The Brazil-Sweden game had the biggest crowd ever for a women’s national team match in the country, and the fans roared whenever Marta touched the ball. The charismatic forward has been one of the world’s top players for more than a decade, but she has never won a major international tournament with her national team. Rio Olympic officials in Brazil have one less trouble to worry about following robberies, stray gunfire and a falling camera outside the basketball arena. The Olympic diving pool, its water turned a murky green a week ago, reverted to its usual blue Tuesday. One off-the-field issue remains unresolved, however. Police investigating reports that American swimmer Ryan Lochte and three teammates were robbed at gunpoint so far have found no evidence supporting the account. Lochte insists he has been upfront about what happened.